Helen Stowell is my 3rd cousin 2x removed. Her parents are Dent Stowell and Helen Gordon. Our common ancestors are John Stowell and Ann Riddeoff, my 4x great grandparents. Helen was born on 21 July 1921 in Wayne, Michigan, USA. 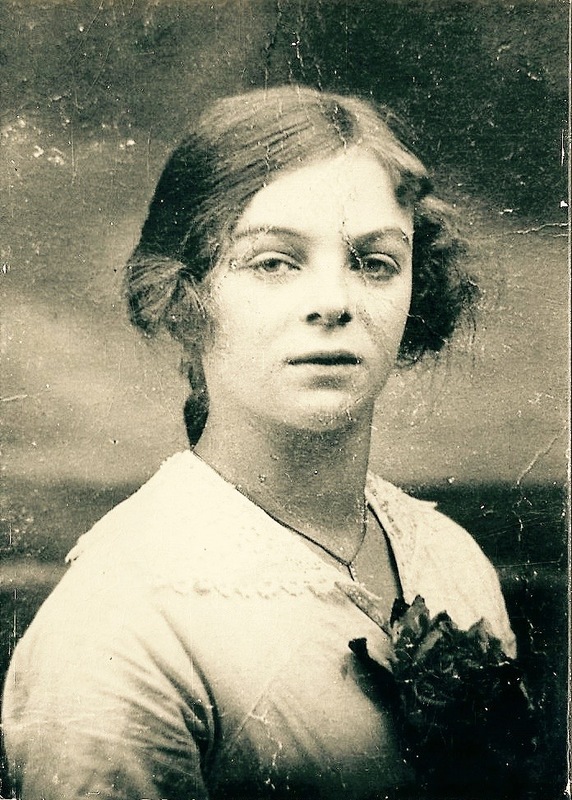 She came to England with her family in 1933. Before joining the W.R.E.N.’s in 1940 Helen worked at Marks and Spencer’s branch in Wolverhampton. While serving in the W.R.EN.’s in Scotland Helen met and married John Park. A report of their marriage is in the Burnley Express of 29 November 1941. A guard-of-honour of Wrens and naval ratings was formed at Bon Accord Church of Scotland, Aberdeen, for the wedding of Mr John Park (R.N. ), son of Mr and Mrs Park, 78 East Crescent, Troon, Ayrshire, to Miss Helen Stowell (W.R.N.S. ), daughter of Mr and Mrs D Stowell, 40 Accrington Road, Burnley. Given away by her friend, Mr A Bengie, of Aberdeen, the bride was charmingly attired in white stiff lace with satin edgings and a veil with a headdress of orange blossom. She carried a bouquet of pink and white chrysanthemums. The bridesmaid, Miss Adeline Downie, who is also serving with the W.R.N.S., wore a white lace with cyclamen edgings and a shepherdess hat of white net. The mixed flowers of her posy toned with those on her dress and hat. The groom’s friend, Mr Felix Clark (R.N. ), was best man. After a reception at the bridesmaid’s home Mr and Mrs Park left to spend their honeymoon in Wolverhampton, the bride travelling in uniform. Dent Stowell is my 2nd cousin 3x removed. I have written about Dent before, here, here and here. Dent was born on 14 July 1882 in Burnley, Lancashire to parents Thomas Stowell and Ann Wroe. Our common ancestors are John Stowell and Ann Riddeoff (my 4x great grandparents). he served in the Black Watch Regiment in South Africa in the Boer War and in France during WW1, being wounded more than once. he had an unhappy first marriage but found love for a second time with Helen Gordon – however he was found guilty of bigamously marrying Helen in 1918, before finally marrying her legally in 1939.
he had eight children from his two marriages. he lived in Canada and in the United States of America. Dent passed away on 28 March 1948 and I recently discovered the following inquest report in the Burnley Express of 31 March 1948. “Death from natural causes” was the verdict recorded by the Burnley Deputy Coroner (Mr C Waddington) at an inquest on Monday on Dent Stowell (65), machine operator, of 89 Marlborough Street, who died on Sunday morning. Mrs Helen Stowell said that her husband had served in the Boer and 1914-18 wars, and in the latter was wounded and badly gassed. His general health had not been good since 1918, but he had never had a serious illness. For the past four months he had complained of chest pains, but would not seek medical advice. On Friday, the pains became worse, and on Saturday he said the pain felt like a lump in his chest. That evening she gave him a Seidlitz powder in warm water and, later, Indian Brandy in warm water, and they retired about 11.15pm. At 12.15am her husband got out of bed, and put the light out before returning. Immediately he had got back into bed she heard strange noises coming from his throat, and, on putting on the light, found him struggling for breath. She helped him to sit up, but he collapsed in her arms. She ran out of the house and asked a passer-by to send for the police, who, on arrival, told her her husband had passed away. Mr R O Davidson, consulting surgeon, said that he had conducted a post-mortem examination, and in his opinion death was due to cardiac failure, due to myocardial degeneration and coronary sclerosis. After Dent’s death Helen moved to America to be with family who had emigrated there. She lived for another 36 years before passing away in 1984. Helen’s family brought her to England for burial alongside Dent and their son Percy in Burnley Cemetery, Lancashire. Dent and Helen had thirty years together and I suspect could tell some tales about their experiences and adventures. This is the first of a three part series about Dent Stowell, my 2nd cousin 3x removed. He was born on 14 July 1882 in Burnley, Lancashire to parents Thomas Stowell and Ann Wroe. Our common ancestors are John Stowell and Ann Riddeoff (my 4x great grandparents). As far as I can tell Dent was the last of nine children to be born to Thomas and Ann Stowell. He was baptised on 20 August 1882 at St John the Baptist church in Burnley. On 30 March 1900 Dent took himself to the army recruiting office in Burnley and signed up for “short service” of three years in the military. The next day he passed his medical examination and was signed fit for the army. He was appointed to the 2nd Royal Highlanders Regiment with a service number of 7778. He joined his regiment in Perth, Scotland on 4 April 1900. I can see from his service records available online that Dent was promoted to the rank of Corporal on 28 February 1902. Then two months later on 24 April 1902 he was posted to South Africa. He completed his three years “short service” on 30 March 1903 and was transferred to the Army Reserve for nine years. Back in civilian life Dent married Rose Ann Cairns on 5 January 1907 at St Matthew the Apostle, Habergham Eaves, Lancashire. Dent was 24 years old and Rose Ann was 19. In the 1911 census the family are living at 2 Zion Street, Burnley. Dent is working as a “plate moulder” and Rose Ann as a “weaver”. At the outbreak of WW1 Dent rejoined the army and was mobilised at Perth on 5 August 1914. He had several postings to France over the next three years. He was wounded in action in November 1917 and then posted home from 27 November 1917 until he was demobbed on 24 March 1919. Here is an account of Dent’s experiences in the Burnley News of 3 October 1914. A thrilling narrative of incidents which have taken place at the Battle of the Aisne has been told to a Burnley News reporter by Private Dent Stowell, of 2 Zion Street, who has returned home to recuperate after having been wounded. Private Stowell is a Reservist in the Black Watch. “I reported myself at Perth Depot, Nig Camp, Cromarty,” he said, “and from there I went to Southampton, where we embarked for France. After a short time in camp at St Lazaire, we had a four days’ journey on the railway, and then we marched for four days, at about thirty miles a day, up to the firing line, about forty miles from operations at the Aisne, where there is a firing line of 150 miles. “We thought then that there were no Germans about, but we could see dead horses, pieces of legs, heads, and other gruesome objects. On Sunday night, September 13th, the German bullets and shells began flying over our heads. At five o’clock on the following morning, we marched out on to a hill, and laid in a trench from about 6 o’clock to 3 in the afternoon. The Germans were shelling the position all the time, and it was not safe for anyone to lift up his head. My mate did so, and he was shot through the brain. After describing his further passage from the scene of conflict by Army Service Corps and motor wagons, and how he was conveyed via temporary bridges of boats and planks, Private Stowell retuned to his experiences in the operations against the enemy. “I eked out existence on one biscuit on the previous Saturday night,” he remarked. “In the fighting a bullet went in my bully-beef tin on my back. Much havoc was caused to my equipment. I could not get a chance to fire back. It was an artillery battle, not an infantry one. Men were mowed down like grass under the terrific fire of the Maxims. “I was conveyed to Le Mons, where the wound was dressed. Then we went along to Nancy, where I was again attended to. Subsequently I was taken to St Lazaire. I left there last Wednesday, and landed at Southampton on Friday morning. I was treated at the Southern Hospital, Birmingham, which I left yesterday (Wednesday) morning. Speaking about the French people, Private Stowell remarked enthusiastically that they were very good. “They will give anything to the English troops. We lived on nothing but fruit. The Germans took all the bread obtainable. Tobacco and cigarettes were sent out, but we never got it. “Oh, yes, we wanted it,” he continued, smilingly. “If you saw one of your men with a cigarette, you would have ‘killed’ him for it. Asked as to whether he had met any other Burnley men during his experience at the front he said, “I bade good-bye to my pal, J W Hurst, of Padiham, on Monday. He belonged to the C Company. We went out together. Then his Company went one way and mine another. On Monday night 200 came in out of 1260 at roll call. There were about 30 left out of the 200 on Tuesday. As I said before, they mowed us down like grass, chiefly with Maxim guns. Look out for the second instalment of the trilogy next Sunday.